Great news for all culture buffs visiting Croatia – there are seven UNESCO World Heritage sites in Croatia for you to explore. UNESCO stands for the United Nations Educational, Scientific, and Cultural Organization. UNESCO World Heritage sites are the places of a special cultural or natural importance. A total of 1.031 sites all over the world made it to the list (as of July 2015). Italy has the most UNESCO World Heritage sites (51 in total). Back to Croatia! Out of those seven UNESCO World Heritage sites in Croatia, six are cultural sites, and one is a natural sites (Plitvice Lakes!). Below is an overview of all of them. Located in a historical center of Porec, the Episcopal Complex of the Euphrasian Basilica dates back to 6th century. The Euphrasian Basilica was erected at the place where previously stood two pre-Roman churches, whose parts are still intact. Floor mosaics belonged to the church dating back to 4th century. This episcopal complex is the one of the best preserved examples of Byzantine architecture in the Mediterraneans. The complex consists of three-nave church, bapistry, sacristy, a bell tower, and an arcbishop's palace. The basilica is famed for its mosaics. This feature alone made Porec known as the “Town of Mosaics”. The Episcopal Complex of the Euphrasian Basilica was inscribed as the UNESCO World Heritage Site in 1997. Trogir is a small medieval town, located just 20 km north of Split. The town is built on a small island, and connected by bridge to the mainland, and the island of Ciovo on the other side. The town was pronounced an UNESCO World Heritage site back in 1997. The old town is almost intact from the time it was built, back in 13th to 15th century, under Venetian rule. The old town features wonderful Venetian architecture, many palaces, churches, cobbled stone streets, alleyways, and town squares, a boardwalk with the Kamerlengo fortress and a castle. The main sights are at the main square including the Cathedral, a bell tower, and a town hall. Inscribed as the UNESCO World Heritage site since 1979, the historical complex of Split with the Palace of Diocletian was built in late 3rd and early 4th century. Today the complex is a large open-air museum, and a living and breathing city. The complex features remains of the ancient palace built for the Roman emperor Diocletian in 4th century, but also the Romanesque churches built in 12th century, medieval fortification walls, and Renaissance, Baroque, and Gothic palaces from 15th century. Split is a lovely place to visit, and one of our favorite places in all Croatia. Besides massive cultural and historical monuments, the town is a major ferry port, popular for its bars and restaurants, interesting day trips, boutique hotels & vacation rentals, and top festivals like Ultra Europe. The most visited town in Croatia, Dubrovnik old town has been inscribed as the Unesco World heritage site since 1979. Dubrovnik was an important sea power in Europe, and an independent state, from 13th to 18th century. Many Gothic, Renaissance and Baroque houses, palaces, churches, as well as city walls are perfectly preserved. An agricultural landscape located near the town of Stari Grad, on the island of Hvar, the Stari Grad plain has remained almost intact since the 4th century BC, when ancient Greeks established their first colonies on the island. People of Hvar still grow their grapes, olives, and veggies on this fertile land. You can witness here the ancient trims and dry-walls. Small farmers' shelters, built of stone without using any cement, still remain intact. It also perfectly shows geometrical system of ancient land division, know as chora. The Cathedral of St. James in Sibenik was inscribed on the UNESCO's list of World Heritage sites back in 2000. This church was built for over 100 years, between 1431 to 1535. This fact alone granted this church a place among UNESCO World Heritage sites, as the church perfectly combines and blends Gothic and Renaissance art. Three famed architects from that time were involved in its construction: Francesco di Giacomo, Georgius Mathei Dalmaticus, and Niccolò di Giovanni Fiorentino. The beauty of this church is in details. If visiting the Cathedral of St. James in Sibenik, make sure to take your time and to pay attention to all artwork and especially 71 sculptured faces that decorate the frieze. Plitvice Lakes are the first natural site in Croatia to be inscribed as an Unesco's world heritage site back in 1979. This is a wonderful site of travertine barriers, waterfalls, streams, and rapids, and 16 interconnected lakes. Read our full post on Plitvice Lakes. 7 UNESCO World Heritage Sites In Croatia ｜Pin me for later! 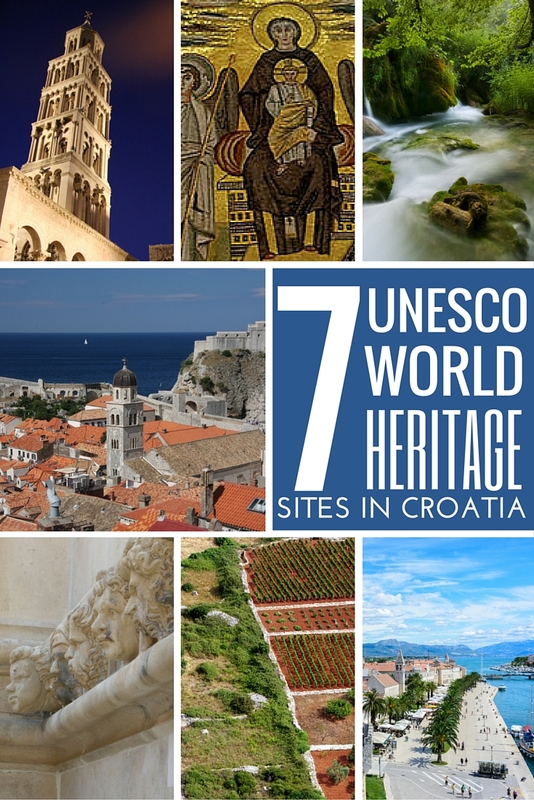 We hope you've enjoyed our overview of the UNESCO World Heritage sites in Croatia. If you have any questions, or suggestion, please leave them in the comments below. Love your website. So informative! We will be visiting Croatia this July 2017 to reconnect with long lost family and explore this fascinating country. I am so looking forward to this visit. Thanks, Judith! Hope you’ll enjoy it. Hi Lauren, hard to say. We’ve found it on this link: http://www.sveisvasta.hr/trgovina/kalupi-i-izrezivaci/kalup-za-paprenjake/. I don’t think they ship it out of the country, but maybe you can contact them by e-mail and ask to do it for you. Good luck :)!